1. Heat a large nonstick pan over medium high heat. Add the ground turkey and Spice of Life and cook thoroughly until turkey is no longer pink. Drain any excess grease from the pan. 2. Heat the pitas on a microwave-safe plate in the microwave on high for 30 seconds. 3. Place pitas on individual plates. 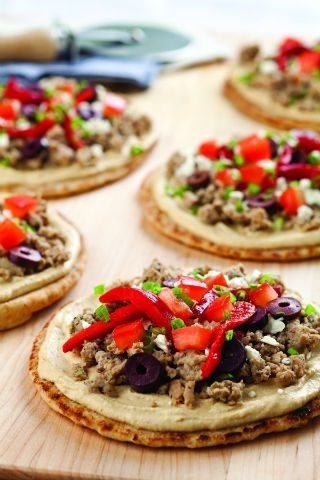 Top each pita with two heaping tablespoons of Zoës Kitchen hummus and spread evenly over pita. 4. Top each pita with 2-3 tablespoons cooked ground turkey, 1 tablespoon crumbled feta cheese, ½ tablespoon Kalamata olives, 1 tablespoon roasted red pepper strips, 1 tablespoon chopped tomatoes and ½ tablespoon chopped scallions. 5. Using a pizza cutter, slice each pita into four wedge-shaped pieces.